These homesick soldiers are, at long last, going back to Kabul. 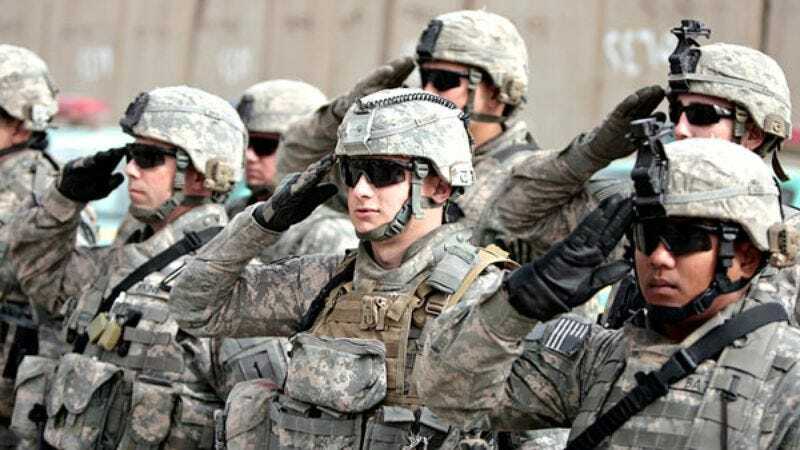 BAGHDAD—Members of the U.S. Armed Forces were reportedly overcome with feelings of joy, nostalgia, and optimism this week after learning they would soon be withdrawn from Iraq and allowed to finally return home to Afghanistan. "I never thought this day would come," said Cpl. Douglas Robinson, who hasn't seen the barren hills and smoking craters of his beloved Kabul in nearly six years. "Being away from those you left behind, for this long, it definitely starts to take a toll on you." The amber waves of blowing sand and rubble. Added Robinson, "I can't believe I'm going home again." In 2003, thousands of American soldiers were unexpectedly uprooted from Afghanistan and sent off to fight in a long and bloody war overseas. After serving multiple tours of duty in Iraq, the vast majority of these troops said they couldn't wait to get back and have their lives return to normal. "It's going to be great to be surrounded by all those familiar faces again," said Pfc. Shawn Brunner, staring wistfully at an old and faded photograph of the bleak wasteland. "The tribal sheiks, the frightened villagers, all that wonderful rubble near the Id Gah Mosque. When I'm finally back on Afghan soil, I'll probably kiss the ground." Like Brunner, marines stationed at Camp al Qaim in Iraq said they longed for the comforts of home, whether it's stopping off at a local eatery for a hot meal of sabzi challow, or spending Sunday afternoon cheering on their favorite buzkashi team. Others reportedly yearned for the day when they would be reunited with their children, many of whom hadn't even been born when their fathers left for Iraq. "I can't wait to meet my little princess, Badria," Lt. David Shapiro said. "I just hope her mother isn't still angry at me." According to military officials, the announcement of the long awaited homecoming has greatly improved morale, with U.S. soldiers looking forward to returning to the one place where they truly felt like they belonged. "Hopefully we'll stay put for a while," said Cpl. Michael White, adding that he couldn't wait to hear the familiar strains of neighbors speaking Dari in the streets. "With any luck we'll be in Afghanistan for another 10 years." While most remained enthusiastic about the trip home, a small percentage of military personnel expressed concerns that Afghanistan had drastically changed since they were called off to war. Others worried that it would now be awkward to interact with local warlords. "I don't want people to treat me weird just because I've been away for so long," Lt. Gerald Karshner said. "I'm sure there will be a period of adjustment. You know, just getting reacquainted with the sounds of slightly less mortar fire, or that special tear gas smell that only Afghanistan has. Still, it'll be great to sleep in my old metal bed again." The journey back will be bittersweet for some. Pvt. Michael Tagle, 24, said he could still remember a more innocent time in his life, when he would drive around all day in a tank with friends, several of whom, sadly, are no longer around. "We had our entire lives ahead of us," said Tagle, who "pretty much grew up" in Kandahar. "Anything was possible. Going to college. Maybe starting a family someday. Even making the world a better place." Added Tagle, "It's funny the things you picture for yourself when you're young." Amid all the fanfare, there was some unpleasant news. Troops in the 11th Marine Regiment were ordered early Tuesday morning to ship off to the United States, a distant foreign land, filled with bizarre customs, strange beliefs, and millions of people they do not know or understand.